Go figure. Who knew that volcanoes could provide the cure for Aphanomyces root rot (ARR), a cursed alfalfa seedling disease that has beaten repeated attempts for control. According to the July issue of USDA's AgResearch magazine, that just might be the case. There is no doubt ARR accounts for more failed new alfalfa seedings than any of us know. It’s a difficult disease to visually diagnose and generally expensive to confirm with routine sample analysis. It has haunted alfalfa growers, field agronomists and researchers for many years. Each time plant breeders think they have developed varieties with some level of resistance, seemingly a new strain or race of the disease is identified in yet another failed new seeding field. The other issue that makes ARR control problematic is that common fungicide seed treatments like mefenoxam, the active ingredient in Apron XL, have little to no efficacy on the disease. Some seed treatments such as Stamina provide variable control depending on variety and environmental conditions. Though diseases such as Phytophthora root rot and Pythium are kept in check, ARR just continues to rear its ugly head. Effectively, controlling ARR has been like herding cats. Zeolite is a naturally occurring compound that comes from degraded volcanic rock. Golf course managers currently use it as a soil amendment to enhance water infiltration and water-holding capacity. Further, it has fungicidal properties and qualifies as an accepted product for use on organic farms. Deborah Samac, a USDA Agricultural Research Service plant pathologist at the University of Minnesota in St. Paul, initiated research to look at the effects of zeolite as an alfalfa seed treatment. In addition, she also wanted to see how zeolite impacted beneficial microbes in the soil and on the health of plant roots. Samac’s research involved testing three different treatments. They included a control with nothing on the seed, mefenoxam-treated seeds, and commercially available zeolite-coated seeds that are sold for organic production. 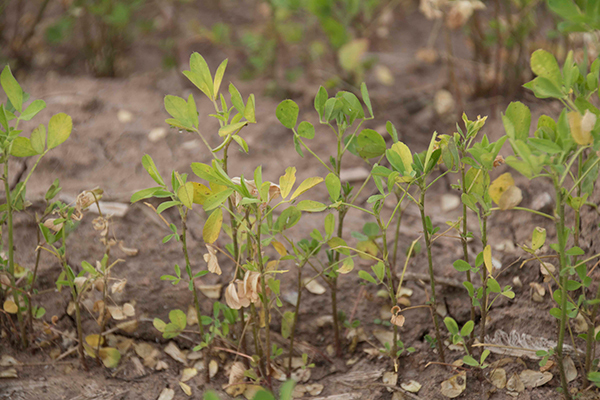 The seeds were inoculated with pathogens that attack alfalfa roots. Soil was also collected from 12 Minnesota alfalfa fields to assess treatment performance in naturally occurring, pathogen-rich soils. The results of the initial study showed that the zeolite coating was as effective as the mefenoxam for protecting seeds from most soil pathogens; however, the mineral coating was better than mefenoxam at protecting the seedling from ARR. A second study done by Samac using zeolite from a different mining source showed less promising results. Though more research needs to be done, zeolite appears to hold some hope for both conventional and organic alfalfa producers. Time will tell.